You gotta have heart and this necklace has more than enough. 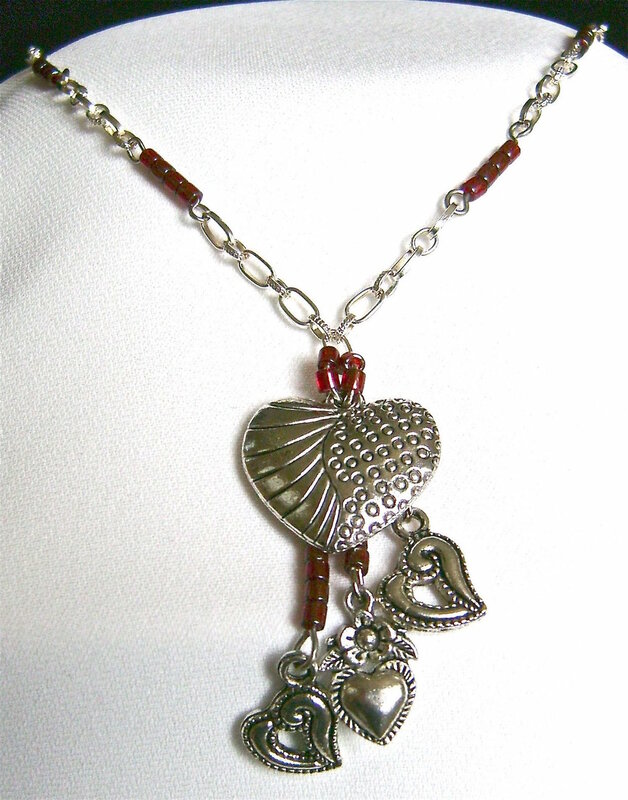 Three small hearts dangle from red beaded wire connected to the large central heart. Red bead sections connect all the chain pieces to create an interesting necklace. step 1 - Cut four pieces of wire to measure approximately 1.25” for the bead connector sections. step 3 - Create the four bead connector sections by making a loop in each wire, stringing on 4 garnet beads, then making another loop. Do not close the loops as they will be attached to chain sections next. step 4 - The 2” section of chain will be the center front for the necklace. Attach a bead connector section to both ends of the chain and close the open loops. step 5 - Attach the 1.25” chain sections to the opposite ends of the two bead connector sections and close the open loops. step 6 - Use the last two bead connector sections to link the 1.25" chain sections to the 5.50" chain sections. step 7 - Attach a toggle clasp to the ends of the chain with a jump ring. The chain is now complete. step 9 - Place a jump ring through the three loops of the dangling hearts sections. step 10 - Before closing it, slip on two garnet beads. step 11 - Place a jump ring through the large central heart and slip on two garnet beads. step 12 - Find the center of your necklace by counting the links in the center front chain or measuring one inch from the end. Slip the jump ring holding the dangling hearts into the center link and close the loop. step 13 - Finish the necklace by attaching the large center heart jump ring onto the same center link. Be sure the dangling hearts hang behind the large central heart.